Last week most of my time was turned to the new project – website and presentation materials for mobile recording studio. The idea for the name came as a result of a brain storm and staring at the wall where the dreamcatcher was hung. The catcher is a word which does suit the concept of a mobile recording truck – it can quickly move to different locations and pick up the best tunes, notes, voices – everything. 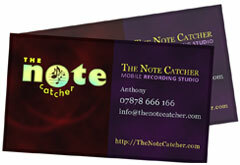 After the name was made up “The note catcher”, work has begun. So far studio’s style (logo, colours and fonts, background), business card design and a page “Under construction” are done, domain name is registered and here is the under construction page. 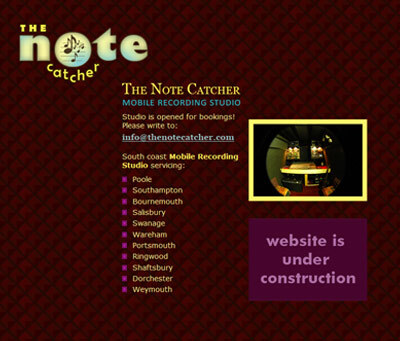 This page gives an idea to users what the website will be about – preview of the studio inside is put on the page, also – contact details for potential customers and a list of towns the studio can serve so search engines find it before the whole website goes live. Dreamcatcher worked as an inspiration for the logo as well – the word “catcher” with the letter “O” from “note” reminds the shape of a dreamcatcher and “O” itself works as a catcher for notes in this design.